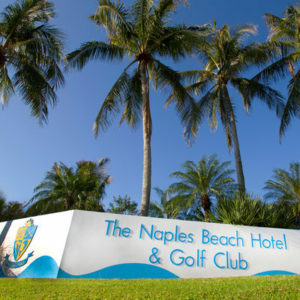 The landmark Naples Beach Hotel & Golf Club has been re-imagined. The Athens Group has unveiled initial plans to redevelop the 125-acre beachfront resort property owned by the Watkins family for more than 70 years. Plans call for the storied hotel to be torn down and rebuilt as a smaller, world-class resort — and for luxury residential towers to be added on both sides of Gulf Shore Boulevard. Meeting space would be cut in half but updated. The 18-hole golf course would not be touched, other than for upgrades. HB’s On the Gulf, the hotel’s signature restaurant, and the Sunset Beach Bar & Grill would be renovated and would reopen to the public, preserving the hotel’s longstanding community connections. “It’s still the Naples Beach Hotel, but it’s in a different form,” said Kim Richards, CEO of The Athens Group. “We’re going to have to close it down for a few years, but it’s still the beach club,” Richards said. The developers have submitted their initial plans to the city. A Design Review Board meeting to present those plans is scheduled for Nov. 28. A vote on whether to recommend approval would come from the board at a later meeting. Plans also need to go to the city’s Planning Advisory Board before reaching the Naples City Council for a final vote. The hope is to win city approval by April or May of next year. The project also would require approval from state and federal agencies. The Watkins family plans to continue operating the hotel and golf club through the 2020-21 season. After that, ownership would transition to The Athens Group, which would redevelop the property in phases. Construction of the first phase, which would include a new hotel, is expected to take about two years. The new hotel would have 220 rooms — almost 100 fewer than the existing hotel, which has 319. Most of the hotel’s more than 400 employees would be out of jobs during construction, but preference would be given to those who want to return to work at the new resort, Richards said. Some employees have worked for the hotel for more than three decades. The Athens Group has created a redevelopment plan that “embraces the resort’s heritage and respects the traditions of the Watkins family.” The goal is to create “a world-class landmark reflecting the distinct coastal character of Naples,” Richards said. “It will be nice progress for the future,” said Michael Watkins, the resort’s president and an owner. The Watkins family chose The Athens Group after meeting with other prospective developers around the country to hear their visions for the property. In October 2016, the Watkins family confirmed it had enlisted “a well respected real estate firm” to look into options for the iconic property, which stretches from the beach to U.S. 41 in the heart of Naples. The family received 15 to 20 proposals from its solicitation, said Henry B. Watkins III, who shares ownership in the property. “There was a whole lot of interest, to say the least, from many corners of the world — or at least the U.S.,” he said. The original hotel was built in the 1880s two blocks east of the Naples Pier. It later relocated to its current site. The Watkinses have owned and operated the hotel since 1946. Henry B. Watkins Sr. was a 50-year-old retired toy manufacturer from Ohio when he bought the original hotel, with The Beach Club and its golf course, and then moved it to its location at 851 Gulf Shore Blvd., overlooking the Gulf of Mexico. The redevelopment plans include building up to 195 residential condos in eight buildings, which would come with hotel services from ironing to room service. Buildings would range in height from four stories to seven, with parking underneath. There would be five residential buildings on the east side of the property, next to the golf course. The other three would be built on the beach side, near the hotel. replacing surface lots with underground parking. The Athens Group’s portfolio includes such well-known hotels and resorts as the Four Seasons in Hualalai, Hawaii, and The Ritz-Carltons in Bachelor Gulch/Vail Valley, Colorado, and Half Moon Bay, south of San Francisco. The flag — or brand — has yet to be chosen for the new Naples Beach Resort, Richards said. The plans for the Naples Beach Resort will continue to be refined, based on input from neighbors and others, Richards said. The developers have begun meeting with city officials, homeowners group representatives and other community leaders to get feedback. So far, the response has been overwhelmingly positive, Richards said. Naples Mayor Bill Barnett said he has not heard any complaints from city residents who have seen what’s planned for the property. He said he likes what has seen of the plans. Duncan J. Cameron, a member of the Gulf Shore Property Owners Association board, said he appreciates the golf course being preserved, although he’s not a golfer. “I walk and bike ride and I love the green space that the golf course provides at the Naples Beach Hotel & Golf Club,” he said. As a member of the Forum Club of Southwest Florida and the Rotary Club of Naples, he said he also likes that developers have promised to continue to allow those groups to use the property’s meeting rooms, as they have done for many years.